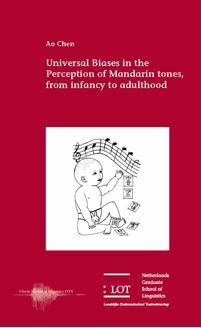 Ao Chen Universal biases in the perception of Mandarin tones : From infancy to adulthood The dissertation investigates the possible innate perceptual biases that may shape the phonological rule in Mandarin , T3 sandhi . T3 sandhi restricts the co - occurrence of two T3s and requires the first T3 to change to a T2 . A second goal of the dissertation is to examine the cross - domain perception of pitch from infancy to adulthood . Mandarin and Dutch adult listeners participated in a categorical perception experiment and a speeded AX discrimination task . It is found that Mandarin listeners perceive Mandarin the T2 - T3 contrast categorically while Dutch listeners perceive this contrast in a psycho - acoustical manner . Nevertheless , both groups of listeners are more accurate in discriminating T2 and T3 if T3 occurs first in the to - be - discriminated pair . This consistency provides strong evidence that there are innate perceptual biases favoring T3 sandhi to occur in such a positional and asymmetrical way . Dutch infants show easier categorization of T3 than of T2 . Hence , the discrimination asymmetry can be a result that T3 works as a better referent in discrimination . Positive significant correlation between musical pitch processing and Mandarin lexical tone discrimination is observed among Dutch adult listeners but not Mandarin adult listeners . Dutch young infants ( 4 and 6 months old ) show facilitated processing of musical pitch while they keep showing difficulties in discriminating Mandarin T2 - T3 contrast , which suggests separate music and speech processing from early infancy . Mandarin infants do not outperform Dutch infants in either musical pitch processing or lexical tone discrimination . No evidence has been found for the correlation between the perception of musical pitch and the perception of lexical tones in early infancy . This dissertation is of interest to psycholinguists , phonologists , and those who work in early perception development in infancy .